The death chamber is Our Lady's special sphere of activity, for those who are in their last agony are her beloved children. A precious fruit of devotion to the dolors of our Blessed Mother is perfect contrition and true compunction for sin before death, and Mary's special protection in the final struggle. 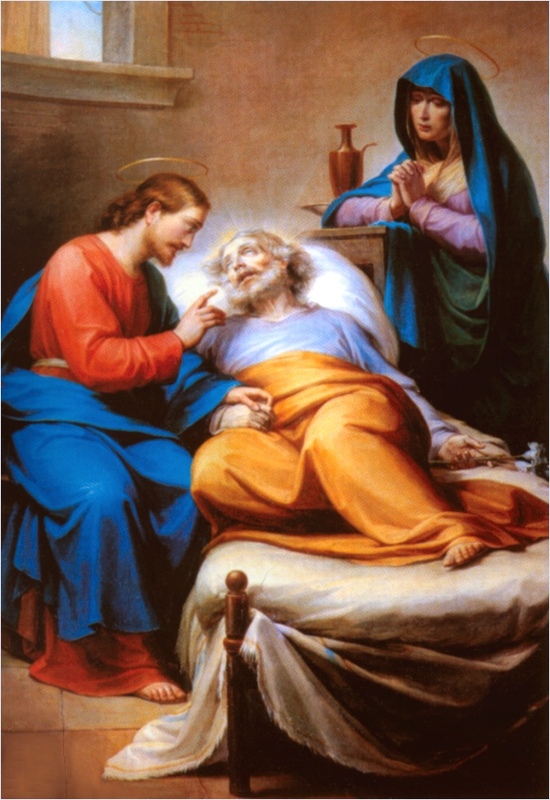 Devotion to the Sorrowful Mother is one of the best preparations for dying well not merely on account of the definite graces promised this devotion for the last hour, but also because it concerns the service that Our Lady rendered to Our Lord at the hour of His blessed death. We read of numberless instances in the lives of saints and devout souls in which Mary appeared to them and aided them visibly in their last hours. However, if this devotion to the sorrows of Mary is to bring consolation at the hour of death, one must have been faithful to it for years. Our Divine Lord revealed to Saint Bridget that because of the compassion His Blessed Mother felt for Him at His death, she became the Mother of all men, especially of the dying. In the infinite love of the Holy Spirit, Mary became the Mother of God, and through her sufferings and compassion, she became our Mother. By her presence at the death of her Son she merited the grace to give special assistance to her children at their death. The Blessed Virgin requested Mary of Agreda to pray very often for the dying, as their sufferings and perils are extremely great. There are sinners in their last agony who have but a few more moments in which to save their souls from eternal perdition. There are just souls who are fighting their last battle to retain the fruits of a devout and holy life. The rage and deceit of Hell, the remembrance of the sins committed, the uncertainty of being in the state of grace, the terrors of the unknown future ---- all unite to depress and burden the soul. But the person who has been devoted to the Mother of God, and especially to her sorrows, will not be deserted. Mary has rescued innumerable souls from Hell even at the last moment. Saint Alphonsus says that whoever dies while loving God and pronouncing the name of Mary cannot be lost. Blessed Vincent Pallotti had great devotion to the Mother of Sorrows. In the acts of the beatification of this servant of God, the following is related: The evil spirit once declared by the mouth of a possessed person that no one who had practiced devotion. to Mary Sorrowful had yet been lost, and that the evil spirits had been commanded by God not to assail with temptations in the hour of death those who had faithfully practiced this devotion. Blessed Vincent was so convinced of the truth of this communication that he frequently mentioned it, to the honor of the Blessed Virgin and for the benefit of the faithful. What a consolation for us to know that the ever-blessed Virgin will assist us at the hour of death if we bear in our hearts a loving and compassionate remembrance of her sorrows! Dominica Clara of the Holy Cross, who died in the reputation of sanctity in 1897, was often favored with apparitions of the Souls in Purgatory. One of these Souls told the servant of God that she owed her salvation solely to her devotion to the sorrows of Mary . Her life had been so wicked that without a special grace from God she could not possibly have been saved, but Mary leaves nothing unrewarded that is done in her honor. During life this person had felt a tender compassion for the Mother of Sorrows, and whenever she beheld an image representing the Dolorous Mother, she prayed the Hail Mary seven times in her honor. She admitted, however, that often she had practiced this devotion more from custom than from interior devotion; for her pious mother had implanted it so deeply in her heart that despite her wayward life she had always remained faithful to it. As a reward for this slight veneration, the Mother of God showed special maternal solicitude for her at the hour of death, recalling to her mind the image of her seven sorrows in so vivid a manner that in her last moments the penitent was seized with most profound contrition for her sinful life. For this reason she obtained the remission of all her sins. According to the information imparted by this Soul, the sorrow she felt for her sins through the intercession of the Mother of Dolors was so great that it expiated not only her sins but also a great part of the temporal punishment due to them. In addition to this incomparably great grace, the Soul, while in Purgatory, was consoled by frequent visits of the Mother of God, each of which mitigated her sufferings. Her torments ceased entirely during the time the Blessed Virgin was personally present. Thousands and thousands of souls, she asserted, who had not committed one twentieth as much evil as she, were eternally lost. " Ah," she exclaimed, "how lively are my sentiments of gratitude when I consider what our dear Heavenly Mother did for me in the last moments of my life! Had it not been for Mary, I, too, should have shared the fate of the reprobates. For all eternity shall my tongue proclaim the love, the goodness, the solicitude of this sweet Virgin; unceasingly my voice shall glorify her with canticles of praise and thanksgiving." Dominica Clara of the Holy Cross writes further that many who are especially devoted to the Sorrowful Mother are scarcely detained in Purgatory at all, and are deprived only for a short time of the vision of God.